Twitter recently made headlines in Japan a couple of weeks ago with its still-ongoing #cherryblossom hashtag campaign which when posted makes a cherry blossom emoji appear. Now users can post the following hashtags to have the respective Pokémon emojis appear: #Bulbasaur, #Squirtle, #Charmander & #MewTwo. 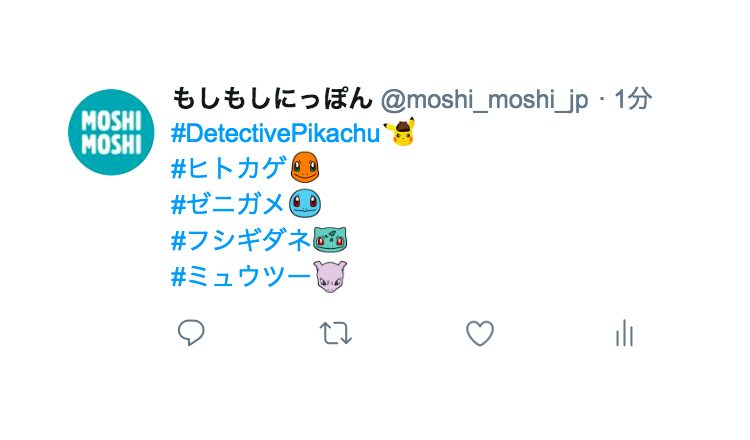 Additionally, in line with the forthcoming release of Pokémon: Detective Pikachu on May 3 in Japan and May 10 in the US, you can make Detective Pikachu himself appear by posting #DetectivePikachu. Try it yourself!